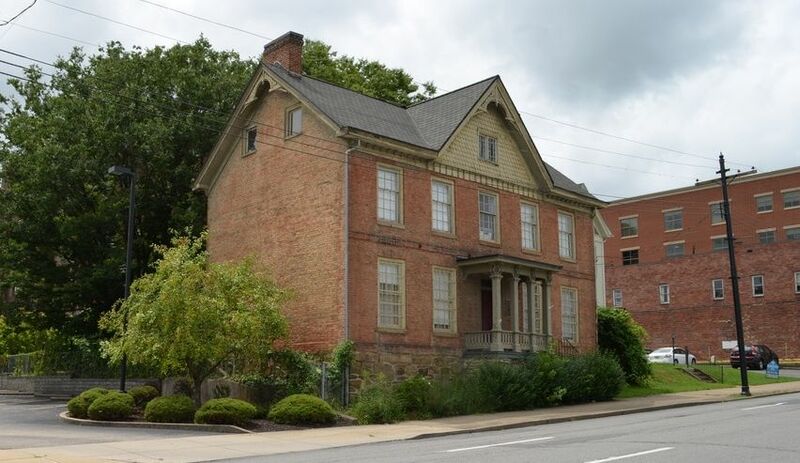 The Stealey-Goff-Vance House, also known as the Amy Roberts Vance House, is a historic home located at 123 W. Main Street, Clarksburg, Harrison County, West Virginia. This 1807 house has served since 1967 as the home of the Harrison County West Virginia Historical Society. The House was listed on the National Register of Historic Places in 1979 and now provides meeting space and repository for historic materials for the Society. Additional information about the House is available at the website of the National Register of Historic Places. It was originally built about 1807, and is a gable roofed two-story brick dwelling. It sits on a high coursed rubble foundation. The house was remodeled about 1891, with the addition of Victorian embellishment. These modifications include the front gable, porch, and ornate cornice millwork. The house was purchased in 1933 by Amy Roberts Vance, mother of Cyrus Vance. In 1967, the property was sold to the Harrison County Historical Society. The house is opened by appointment and for special events. Tours of the House and other events are scheduled throughout the year. Contact the society to arrange a visit at the Stealey-Goff-Vance House. Or stop by are archival office Monday through Friday 9-5 at 215 South 3rd Street 8th Floor, Suite 801 Clarksburg, WV. We are always looking for funding to repair and preserve the Stealey-Goff-Vance House through grants, fundraising, and donations. If you would like to aid in that effort, please go to CONTRIBUTE to help.